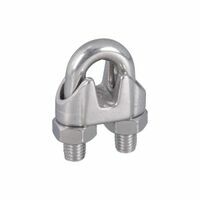 National Hardware Wire Cable Clamp, Series: MP3230B, 1/8 in Opening, Steel U-Bolt/Nuts, Malleable Iron Saddle, Zinc Plated, 2 in Height, 3 in Width, 3 in Length, Federal FF-C-450D, Type 1, Class 2, For Forming an Eye or Loop on Wire Rope National Hardware Wire Cable Clamp, Series: MP3230B, 1/16 in Opening, Steel U-Bolt/Nuts, Malleable Iron Saddle, Zinc Plated, 2 in Height, 3 in Width, 3 in Length, Federal FF-C-450D, Type 1, Class 2, For Forming an Eye or Loop on Wire Rope Do Not use on coated cable; if used on coated cable, remove coating from assembly area. 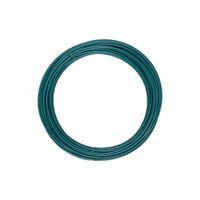 Do Not use on coated cable; if used on coated cable, remove coating from assembly area. 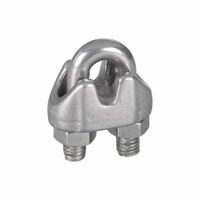 National Hardware Wire Cable Clamp, Series: MP3230BC, 5/16 in Opening, Steel U-Bolt/Nuts, Malleable Iron Saddle, Zinc Plated, 2 in Height, 3 in Width, 4 in Length, Federal FF-C-450D, Type 1, Class 2, For Forming an eye or Loop on Wire Rope Do Not use on coated cable; if used on coated cable, remove coating from assembly area. National Hardware Wire Cable Clamp, Series: MP3230B, 3/8 in Opening, Steel U-Bolt/Nuts, Malleable Iron Saddle, Zinc Plated, 2 in Height, 3 in Width, 5 in Length, Federal FF-C-450D, Type 1, Class 2, For Forming an Eye or Loop on Wire Rope Do Not use on coated cable; if used on coated cable, remove coating from assembly area. Designed to make strong wire rope loops. Not designed for load bearing applications. Follow swaging instructions that are included in package. (2) Cable Ferrules and (2) Cable Stops. Made from aluminum.Do not use on coated cable. For use with wire cable. Designed to make strong wire rope loops. Not designed for load bearing applications. Follow swaging instructions that are included in package. Designed to make strong wire rope loops. Not designed for load bearing applications. Follow swaging instructions that are included in package. (2) Cable Ferrules and (2) Cable Stops. Made from aluminum.Do not use on coated cable. Do Not use on coated cable; if used on coated cable, remove coating from assembly area. Designed for forming an eye or loop on wire rope. Meets torque value of Federal Specifications FF-C-450D, Type 1, Class 2. Anchoring point for webbing or strap. Steel U-bolt and nuts. Malleable iron saddle. Always follow requirements for number of clamps per loop according to wire rope thickness Designed for forming an eye or loop on wire rope. Meets torque value of Federal Specifications FF-C-450D, Type 1, Class 2. Anchoring point for webbing or strap. Steel U-bolt and nuts. Malleable iron saddle. Always follow requirements for number of clamps per loop according to wire rope thickness Do Not use on coated cable; if used on coated cable, remove coating from assembly area. U-bolts with saddles and bolts on either side. Pack includes 3 rope clips and a thimble. Do Not use on coated cable; if used on coated cable, remove coating from assembly area. For use with wire cable. Baron Wire Rope Clip, 3/16 in Opening, Malleable Iron, Galvanized For use with wire cable. Designed to make strong wire rope loops. Not designed for load bearing applications. Follow swaging instructions that are included in package. Baron Wire Rope Clip, 1/4 in Opening, Malleable Iron, Galvanized Designed for forming an eye or loop on wire rope. Meets torque value of Federal Specifications FF-C-450D, Type 1, Class 2. Anchoring point for webbing or strap. Steel U-bolt and nuts. Malleable iron saddle. Always follow requirements for number of clamps per loop according to wire rope thickness Designed to make strong wire rope loops. Not designed for load bearing applications. Follow swaging instructions that are included in package. Midwest Drywall Screw, NO 8 Screw, 2-1/2 in Length, Bugle Head, Phillips Drive, NC Thread, Phosphate, Black Midwest Drywall Screw, NO 6 Screw, 1-5/8 in Length, Bugle Head, Phillips Drive, NC Thread, Phosphate, Black For use with wire cable. 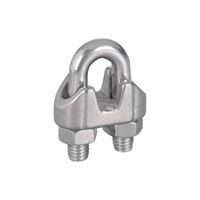 National Hardware Wire Cable Clamp, Series: MP3230BC, 3/4 in Opening, Steel U-Bolt/Nuts, Malleable Iron Saddle, Zinc Plated, 3 in Height, 2 in Width, 1 in Length, Federal FF-C-450D, Type 1, Class 2, For Forming an Eye or Loop on Wire Rope For use with wire cable. Wire used to add stability. Wire used to add stability. Very strong, low-stretch line constructed of twisted wire cable and protected with a tough abrasion- and weather-resistant forest-green vinyl jacket. Very flexible, easy to handle. Does not absorb dirt, wipes clean with a damp cloth. 5/32" Nominal Diameter. 50'L. Bagged. Green. (2) Cable Ferrules and (2) Cable Stops. Made from aluminum.Do not use on coated cable. 15 gauge. For use with wire cable. Use for drywall to 20 gauge to 14 gauge steel studs. For use with wire cable. Do Not use on coated cable; if used on coated cable, remove coating from assembly area. Use for exterior projects where rust resistance is not as important. Use for exterior projects where rust resistance is not as important. Use for exterior projects where rust resistance is not as important. Use for exterior projects where rust resistance is not as important. Camo Deck Screw, Multi-Purpose, NO 10 Screw, 3-1/2 in Length, Bugle Head, T25 Drive, Star Drive, Type 17 Slash Point, Protech, Tan Heat treated steel body with carbon steel hooks. Intended for use in light duty farm, fencing and industrial binding applications where load factor is minimal. 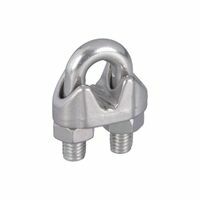 Hook swivels 360 degrees and tightener is designed to toggle away from load. 15 gauge. Camo Deck Screw, Multi-Purpose, NO 9 Screw, 2-1/2 in Length, Bugle Head, T25 Drive, Star Drive, Type 17 Slash Point, Protech, Green Extruded constrution. Used for creating eye terminations on cable or wire rope. Coated fasteners ideal for pressure treated lumber applications and for all outdoor wood construction such as decking, patios, lawn furniture, window boxes. Reduces wood splitting and superior holding power. Coated fasteners ideal for pressure treated lumber applications and for all outdoor wood construction such as decking, patios, lawn furniture, window boxes. Reduces wood splitting and superior holding power. Coated fasteners ideal for pressure treated lumber applications and for all outdoor wood construction such as decking, patios, lawn furniture, window boxes. Reduces wood splitting and superior holding power. Extruded constrution. Used for creating eye terminations on cable or wire rope. Use for exterior deck and railing projects where rust resistance is important. Use for exterior deck and railing projects where rust resistance is important. Camo Deck Screw, Multi-Purpose, NO 9 Screw, 3 in Length, Bugle Head, T25 Drive, Star Drive, Type 17 Slash Point, Protech, Tan Coated fasteners ideal for pressure treated lumber applications and for all outdoor wood construction such as decking, patios, lawn furniture, window boxes. Reduces wood splitting and superior holding power. Coated fasteners ideal for pressure treated lumber applications and for all outdoor wood construction such as decking, patios, lawn furniture, window boxes. Reduces wood splitting and superior holding power. 9 gauge. Ideal for brace wire, clothesline and dozens of other uses. Available in annealed or galvanized finishes. Ideal for brace wire, clothesline and dozens of other uses. Available in annealed or galvanized finishes. Camo Deck Screw, Multi-Purpose, NO 8 Screw, 2 in Length, Bugle Head, Star Drive, Type 17 Point, Tan Use for drywall to wood studs and all purpose wood fastening. Use for drywall to wood studs and all purpose wood fastening. "Y" Type Tenso Pattern. Includes of two "Y" chain/two ceiling hooks. 7-1/2' overall length. No.2/0 leader 5' long; No.1/0 branches 2-1/2' long. Highly recommended for seaside applications and maximum corrosion resistance. Unique 4-corner thread-form with raised ridge technology greatly reduces driving torque. 6 lobe drive virtually eliminates driver bit cam-out. Self-countersinking nibs under head insure flush installation. Penetrate hardest wood products with ease; often without pre-drilling. Threaded approximately 2/3 up shank to tightly draw deck board to joist. Made of solid 316 stainless steel for maximum corrosion resistance. Contractor's Packs will fasten 500 square feet of decking (6" boards on 16" centers). Deck Packs will fasten 100 square feet of decking (6" boards on 16" centers). NOTE: DO NOT OVER-DRIVE. Lever load binder used to tighten chain, typically for cargo securement. Double swivel lever, for chain size 1/4"/20 and 43, Meets U.S. D.O.T. 393.100-393.102 requirements for use with chain. DO NOT use for overhead lifting or hoisting or exceed working load limits. Use for drywall to 20 gauge to 14 gauge steel studs. Corrosion resistance for harsh environments. Zero stripping recessed star drive. Interior/exterior use. No pre-drilling unless material requires. Self-countersinking. Star head recess/non stripping heads. Can be used with fibrous materials. Extruded constrution. Used for creating eye terminations on cable or wire rope. Pro-Fit Drywall Screw, NO 6 Screw, 1-5/8 in Length, Phillips Drive, Coarse Thread, Gold, For Interior Projects Pro-Fit Drywall Screw, NO 7 Screw, 2 in Length, Phillips Drive, Coarse Thread, Gold, For Interior Projects Drop forged and heat treated steel handle and hooks with 360 degree swivels on both hooks to allow straight line pull. E-coat finish helps extend useful life of binder. Meets or exceeds WSTDA T-6 and FMCSA standards. Chain size limits designed to maximize working load limit (WLL) of transport chain being used. Note: Chain binders are not constructed with G70 steel but instead engineered to meet or exceed the stated working load limit marked on the handle. G70 is a chain rating only. WARNING: Secure by hand. Never use ?cheater bar? or attempt to overtighten binder due to risk of personal injury due to lever snap back or chain breakage. Only approved handle extensions should be used to release tension gradually. Camo Deck Screw, NO 10 Screw, 2-1/2 in Length, Bugle Head, T25 Drive, Star Drive, Type 17 Point, 316 Stainless Steel Use for exterior projects where rust resistance is not as important. Use for exterior projects where rust resistance is not as important. Camo Deck Screw, Multi-Purpose, NO 9 Screw, 3 in Length, Bugle Head, T25 Drive, Star Drive, Type 17 Slash Point, Protech, Tan Use for exterior deck and railing projects where rust resistance is important. Use for exterior deck and railing projects where rust resistance is important. Corrosion resistance for harsh environments. Zero stripping recessed star drive. Interior/exterior use. No pre-drilling unless material requires. Self-countersinking. Star head recess/non stripping heads. Can be used with fibrous materials. Use for drywall to 20 gauge to 14 gauge steel studs. Coated fasteners ideal for pressure treated lumber applications and for all outdoor wood construction such as decking, patios, lawn furniture, window boxes. Reduces wood splitting and superior holding power. Coated fasteners ideal for pressure treated lumber applications and for all outdoor wood construction such as decking, patios, lawn furniture, window boxes. Reduces wood splitting and superior holding power. Coated fasteners ideal for pressure treated lumber applications and for all outdoor wood construction such as decking, patios, lawn furniture, window boxes. Reduces wood splitting and superior holding power. 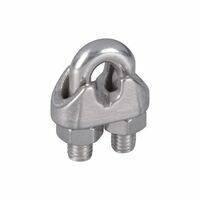 For securing ferrules and stops onto wire rope or cable Use on rope sized 1/8 - 3/16". Do not swage on coated cable. Heat treated single piece steel handle and heat treated forged hooks with 360 degree swivels on both hooks to allow straight line pull. Pre-lubricated ACME threaded screws require limited maintenance. Internal thread stop feature. E-coat finish helps extend useful life of binder. Meets or exceeds WSTDA T-6 and FMCSA standards. Chain size limits designed to maximize working load limit (WLL) of transport chain being used. Note: Chain binders are not constructed with G70 steel but instead engineered to meet or exceed the stated working load limit marked on the handle. G70 is a chain rating only. WARNING: Secure by hand. Never use ?cheater bar? or attempt to overtighten binder due to risk of personal injury. Ratchet mechanism and handle length is sufficient to break chain when overtightened. 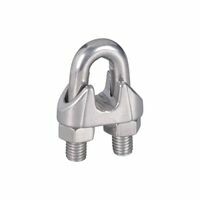 Safety stops prevent threads from being overextended Drop forged and heat treated steel handle and hooks with 360 degree swivels on both hooks to allow straight line pull. E-coat finish helps extend useful life of binder. Meets or exceeds WSTDA T-6 and FMCSA standards. Chain size limits designed to maximize working load limit (WLL) of transport chain being used. Note: Chain binders are not constructed with G70 steel but instead engineered to meet or exceed the stated working load limit marked on the handle. G70 is a chain rating only. WARNING: Secure by hand. Never use ?cheater bar? or attempt to overtighten binder due to risk of personal injury due to lever snap back or chain breakage. Only approved handle extensions should be used to release tension gradually. Designed to swage ferrules and stops in making wire rope loops. Hardened steel body and bolts to give swaging strength. User to use when combined with a vise to hold swage tool steady. Follow swaging instructions that come with ferrules and stops. Coated fasteners ideal for pressure treated lumber applications and for all outdoor wood construction such as decking, patios, lawn furniture, window boxes. Reduces wood splitting and superior holding power. NanoGard fluoropolymer coated fasteners are designed for pressure treated lumber applications and for all outdoor wood construction for decking, patios, lawn furniture, window boxes, etc. Clothesline wire is durable and long lasting. Camo Deck Screw, Multi-Purpose, NO 10 Screw, 4 in Length, Bugle Head, T25 Drive, Star Drive, Type 17 Slash Point, Protech, Green Clothesline wire is durable and long lasting. Clothesline wire is durable and long lasting. Camo Deck Screw, NO 10 Screw, 1-5/8 in Length, Bugle Head, T25 Drive, Star Drive, 316 Stainless Steel Ratchet load binder used to tighten chain, typically for cargo securement. 8" in take-up. For chain size 5/16" (System 7) and for chain size 3/8" (System 4) Meets U.S. D.O.T. 393.100-393.102 requirements for use with chain. DO NOT use for overhead lifting or hoisting or exceed the working load limit. Coarse threads approximately 2/3 up shank draw board tightly to substrate . Pre-drilling always recommended, and a must near board ends to prevent splits. .344" diameter #2 Square Drive Bugle Head ; 'Beaver Bite' type 17 auger point for extra fast starts. Application: Pressure Treated Lumber. Painted heads that escape notice in the material. Durable, powder-coated finish. Course threads approximately 2/3 of the way up shank to draw board tightly to substrate. ' Beaver Bite' type 17 auger point for extra fast starts. Designed to swage ferrules and stops in making wire rope loops. Hardened steel body and bolts to give swaging strength. User to use when combined with a vise to hold swage tool steady. Follow swaging instructions that come with ferrules and stops. Ideal for sprocket wheel, overhead door chains, general utility use. WARNING: DO NOT EXCEED the working load limits for chain or components. DO NOT USE for overhead lifting or hoisting. DO NOT USE if the chain or components are visibly distorted or worn. Camo Deck Screw, NO 10 Screw, 2-1/2 in Length, Bugle Head, T25 Drive, Star Drive, Type 17 Point, 316 Stainless Steel Corrosion resistance for harsh environments. Zero stripping recessed star drive. Interior/exterior use. No pre-drilling unless material requires. Self-countersinking. Star head recess/non stripping heads. Can be used with fibrous materials. Hobby and Craft clock chain. WARNING: DO NOT EXCEED the working load limits for chain or components. DO NOT USE for overhead lifting or hoisting. DO NOT USE if the chain or components are visibly distorted or worn. Campbell Twist Chain, NO 90 Chain, 82 ft Length, 5 lb Load Capacity, 0.056 in Material Diameter, 0.21 in Inner Length, 0.12 in Inner Width, Nickel Plated For general utility, farm and animal applications. WARNING: DO NOT EXCEED the working load limits for chain or components. DO NOT USE for overhead lifting or hoisting. DO NOT USE if the chain or components are visibly distorted or worn. Use for brace wire, clothesline and other applications. Ideal for brace wire, clothesline and dozens of other uses. Available in annealed or galvanized finishes. Ideal for brace wire, clothesline and dozens of other uses. Available in annealed or galvanized finishes. Ideal for brace wire, clothesline and dozens of other uses. Available in annealed or galvanized finishes. Counter-balance chain for double hung window sashes; also for arc lamp chain, animal chain. WARNING: DO NOT EXCEED the working load limits for chain or components. DO NOT USE for overhead lifting or hoisting. DO NOT USE if the chain or components are visibly distorted or worn. WARNING: DO NOT EXCEED the working load limits for chain or components. DO NOT USE for overhead lifting or hoisting. DO NOT USE if the chain or components are visibly distorted or worn. For hanging fixtures and plants, animal ties. WARNING: DO NOT EXCEED the working load limits for chain or components. DO NOT USE for overhead lifting or hoisting. DO NOT USE if the chain or components are visibly distorted or worn. Use for brace wire, clothesline and other applications. For general utility, farm and animal applications. WARNING: DO NOT EXCEED the working load limits for chain or components. DO NOT USE for overhead lifting or hoisting. DO NOT USE if the chain or components are visibly distorted or worn. Uses: Marine applications, wherever non-nagnetic, electrically welded corrosion resistant chain is needed. Bright finish.